I am a dare devil when it comes to beauty products. My mom is afraid of jumping from one product brand to other but bleh~ I need to find my perfect match. Kyaa~ For today I'll review a facial wash I use, it's available nationwide and its from a trustworthy name- Celeteque. I took a quick round in the shelves and found Celeteque. My tita uses the scrub counterpart of the Hydration Line and it's good. What harm can Celeteque do? This is a full size bottle and it's really affordable! Jackpot! CELETEQUE DermoScience™ Hydration Facial Wash has Natural Moisturizing Factor(NMF) that helps restore the skin’s proper moisture balance. It also has mild cleansing agents that effectively clean without drying the skin. Apply CELETEQUE DermoScience™ Hydration Facial Wash on wet skin. Massage in a gentle circular motion. Rinse thoroughly. Use as often as needed. 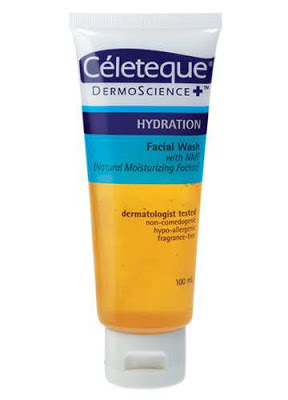 Use CELETEQUE DermoScience™ Hydration Exfoliating Facial Wash every other day to revitalize tired-looking skin. The consistency of Celeteque is liquid, it doesn't really lather up but it still cleanses well. I use this after my make-up remover and it leaves my skin moisturized and clean. I still use toner in my regimen though. When I bought this I even asked the cashier if it's normal that the bottle is only 3/4 full. LOL. She said yes, I haven't dropped by in Watsons or Mercury Drug again to check. It really makes my skin clean and supple! True to it's claim -it has no scent! -Products with too much scent is said to be more acnegenic. Affordable! Just imagine if this is an expensive facial wash that you'll need to use everyday you'll be too cautious on how much you'll use. Yes I think this is a cost-effective product and it simply does it's job. I am looking forward into using the Hydration line's gentle exfoliating facial wash next. Celeteque Dermoscience Hydration facial cleanser at goods.ph a week ago and I found it very effective compared to other facial cleansers. My safe is now soft and smooth. Thank you so much for this post! I used Eskinol cleanser with Celeteque facial wash. I usually buy this at Mercury Drug. Thanks for dropping by Ashley! so is eskinol the product that eradicate your acne?